A visit from a tiny red robin bringing many messages this morning! This morning, as I walked through to my kitchen, I thought to myself, ‘good heavens! that bird I can hear flying around sounds very close!’ – I knew I’d left both my front & back doors open. Then I saw him – this tiny Robin flying around my lounge. In South Africa, birds in the house were a regular occurrence & it was usually quite a mission to get them out – but then, it was a large, double volume thatch with two wide sliding doors kept open most of the year. The Indian Mynahs, which had finally managed to migrate from the KwaZulu-Natal coast to the high veldt in Gauteng, often used to fall down our chimney, when what they were really hoping to do, was make a nest there. As we had a guard on the fireplace year round, they wouldn’t be able to escape into the house. When we did let them out, we would generally end up with soot everywhere. One particular day, however, one – super-intelligent – Mynah, immediately took a right turn, through to the kitchen, another sharp right & out of the back door – it looked for all the world as if he knew exactly where to go & had it all pre-planned! This wee Robin was hovering close to the window, where, on the other side of the glass, was another one, as if reassuring the little one inside that all would be well. I slowly walked towards him, talking softly, telling him that if he’d let me pick him up, I would take him outside where he would be safe again. To my utter amazement, he let me! 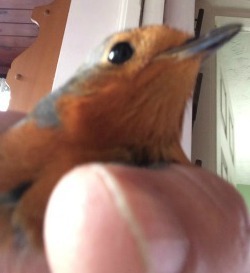 I gently scooped him up in my hand, quickly grabbed my phone on the way out of the door to take a quick snap, took him outside & put him in the garden, whence he flew away. Returning to my house, of course, I found not only bird poop on my kitchen floor, in my bath (which had been run ready for me to get into! 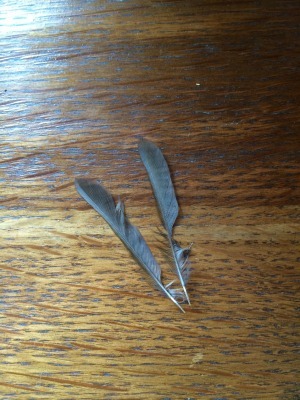 ), in the shower and on the basin, but also two tiny feathers. Those of you that know me well will understand the significance of those to me.